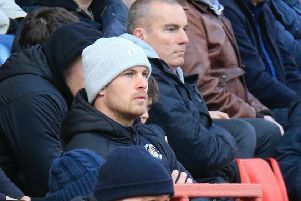 It might not have been vintage by any means, but Luton Town bounced back from Saturday's defeat against Swindon Town to heap further misery on bottom side Port Vale this evening. An own goal from Ben Whitfield plus Jack Stacey's first strike for the club ensured that the Hatters came through what was a tricky test on a difficult night under the lights at Kenilworth Road. Town boss Nathan Jones made two changes, with Glen Rea replacing the suspended Scott Cuthbert, while Luke Berry was preferred to Olly Lee in midfield. Despite their opponents heading into the match having gone five games without a win, failing to score in their last four games too, they proved to be a tough nut to crack, setting up a wall of white shirts that Luton just couldn't penetrate. The hosts should have done just that on 12 minutes, as Andrew Shinnie ghosted into the box to meet Berry's cross, but from six yards out, misdirected his header horribly wide. Clearly eager to make up for his miss, the midfielder tried his luck from further out, shooting straight at Sam Hornby. A tepid first half then finally flickered into life on 38 minutes as Luton found a dash of tempo, and after some incisive one touch passing through the middle, Berry's pass cannoned against Whitfield, giving the wrong footed Hornby no chance. Vale then looked for a response, Anthony de Freitas's free kick drawing an excellent full length save from Marek Stech. After the break, the game finally had some entertainment to warm the home fans, as Town netted the second that they craved on 50 minutes. From a Vale corner, and with men committed forward, Alan McCormack strode away and found full back Jack Stacey, still well inside his own half. The right back sent off on a lung bursting run and as the space opened up, let fly from 18 yards, catching Hornby by surprise, with the ball arrowing into the roof of the net. David Worrall's 35 yard blast didn't miss by much, before Luton almost had a third, James Collins sending Pelly-Ruddock Mpanzu clear on the right, with Hornby parrying his fierce blast. Luton still looked to try and grab another, as Vale finally took risks, Shinnie firing into the side-netting, while Worrall was getting closer, his effort deflected narrowly wide. Stech then tipped over from de Freitas, while the keeper was becoming far more overworked that he would have wanted, with a quite brilliant low stop from Worrall's low drive. Berry fired over late on, but despite some late scares, Town had the victory they wanted, ahead of this weekend's trip to Wycombe Wanderers. Hatters: Marek Stech, Jack Stacey, Dan Potts, Glen Rea, Alan Sheehan, Alan McCormack, Pelly-Ruddock Mpanzu, Luke Berry, Andrew Shinnie (Harry Cornick 84), Danny Hylton, James Collins (Elliot Lee 90). Subs: James Shea, Johnny Mullins, Olly Lee, James Justin, Luke Gambin. Vale: Sam Hornby, Tom Anderson, Joe Davis (Rekell Pyke 84), Tom Pope, David Worrall, Tyrone Barnett (Dan Turner 62), Nathan Smith (C), Anthony de Freitas, Ben Whitfield, Gavin Gunning, Harry Middleton (Jack Stobbs 73). Subs not used: Lawrie Wilson, Tyler Denton, Antony Kay, Ryan Boot. Booked: Middleton 54, McCormack 65.